Oil(contaminated) is passed through high voltage which charges the suspended dirt particles, and charged particles are pushed towards positive and negative electrodes. In the process contaminants get entrapped in collecter medium and thus all particles even of submicronic size is removed from oil. Mainly used for any oil of less than 220 cst., specially popular in hydraulic oil case. Now, the manufacturer claims that after cleaning the oil from this filtration system and adding 10% of fresh charge, same oil can be used for forever by repeating the same process. Please let me know if somebody have come across this type of filtration system, and what would be the effect on oil after few repetetive cleaning cycles.As according to me after continuous use,depetion in additive package can't be make up by adding onle 10% of fresh charge. Pl. give comments on any aspect of this particular system. A couple of things to remember is that not all oils are full of additaves that get used up. I will speak in generalities here but for my industry I rarely condemn an oil because the additave package has been depleated to the point where it has to be replaced. Since we implemented oil changes based on condition (condition based maintenance) several years ago. We have had some applications that have lasted for 5+ years without an oil change. Our oils are normally changed out because of contamination ingress or generation, some contaminents are not easily filtered out. Rarely do we change the oil because of oxidation by-products the real selling attribute of the electrostatic systems. These types of systems make sence for some industries, (you mentioned hydraulics-- where sludge and varnish are REAL issues) I have not found the need in my field. I get suspicious when someone claims that they can selectively charge particles that are contaminents or wear when some of the contaminents can actually be additaves in other lubricants. Electrostatic filters are great things but they operate very slowly and lose effectiveness as moisture content rises. There are some reports that electrostatic filtration will remove bi-products of oxidation and can filter to well beloew 0.5 microns. There are some plastic injection mouldings machines that actually use electrostatic filtration (I think, but don't quote me, Kawaguchi are one). As for the additives, in my opinion, they can cause more problems then if they were absent. But if you know what you are doing, sweetening the oil with new additives can be effective for life extension, although I would advise extreme caution with this approach. Oils theoretically could last forever in the right conditions. But in my opinion, there are too many factors such as oxidation that cause a chemical breakdown of the oil. So you can keep removing the contamination but eventually, there will be none left. Electrostatic oil cleaners are excellent contamination control devices for some applications. You seem to have a good grasp of the basics. As one post pointed out, they excel in areas where degradation mechanisms are at play causing deposits. Although they do not work well in the presence of water, you will have much more urgent concerns if you have a high water content in your oil. Electrostatic oil cleaners continue to work well again once your water problem is under control. But, no contamination control device will take the place of oil analysis and conditioned-based oil changes. Finally, I encourage you to read some of Dr. Sasaki's papers and research on electrostatic oil cleaning for additional information. He has done exhaustive research on the subject and his findings have been widely published. I have just been reading about Balanced Charge Particle (BCP) system for removing oxidation particles, varnish etc from compressor oil systems, does anyone have experience with this new technology which is claimed to be superior for this type of problem? The concept of agglomerating particles through an electric field was first developed in Japan in the mid-1970’s. A high DC charge was passed through the oil, quickly agglomerating the particles and significantly improving the efficiency of filters. Particle agglomeration often occurs when energy is imparted onto fluid, but quickly dissipates when the energy source disappears. Since a high charge was used, the oils became very clean, very quickly. Although this technology was patented, a commercial product was never developed because the scientists could not figure out a method to safely do this to oil without a chance of additional problems occurring. The applied charge remained on the particles to keep them combined together well after the fluid passed over the electrodes. 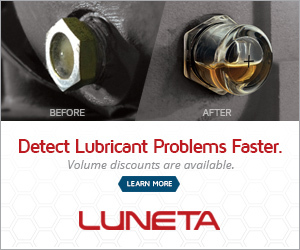 This creates a host of potential problems, such as erratic, unpredictable particle agglomeration in unwanted areas of the lubrication system, or accelerated oil oxidation. Of even greater concern is a release of the accumulated charges in the form of a spark causing safety issues. "Balanced Charged Agglomeration" is not a science definition but a marketing term. Although it is foreseeable that this technology could be applied in a range of other markets, I believe that significantly more research needs to be done on the technology before it can safely be applied to lubricants. Before you purchase the technology, read some independent scientific papers and consult with your oil supplier. It is true that hydraulic oil can be used indefinitely provided you keep it superclean and free from moisture, dissolved gases and air. However, the Electrostatic system is not the right equipment for ensuring the above. You should use the Klarol Oil Cleaning system for keeping the oil free from contamination. 1. Oil cannot be used indefinitely without top up. Additives are sacrificial in nature and eventually deplete. If it were possible to use a hydraulic oil forever, oil companies could save a lot of money and just sell users base oils without additives. 2. There is not one right contamination control technology for all applications. I have been offering Oil Cleaning Services to many Plastic Items manufacturing Units with Off Line Mechanical Filtration Unit fitted with Laser Particle Counter and it cleans the Oil up to required Oil Cleanliness level Automatically and prit out the report indicating Oil Cleanliness level before and After Filtration. This report indicates Particle Count of each range ( 5 to 15, 15 to 25, 25 to 50, 50 to 100 and > 100 ) and also indicates oil cleanliness level in terms of NAS / ISO. As per my experience Electrostatically Oil Cleaning is normally known as Bleed and Feed Type Filtration. That means when you filter the Oil Additives are also removed along with contaminants and you need to replenish it. Unless you have a right source of this additive supplier you should not add such additive peckage with out full information. This may damage the Oil. I therefore strongly recommond you to use Mechanical Filters and get the Oil Cleanliness level within the prescribed Oil Cleanliness level only. Do not Polish the Oil. How many times that the same oil can be purified by Electrostatic oil cleaner? Apart from millipore test any other test that gives about the afterclean results? Does this system can also be used for thermic fluid oil? My experience of visiting many user sites of electrostatic filter systems is that the oil life is extended but water and acid in the applications is the limiting factor. In must user manuals water above 400 ppm water or acid above 2 will cause problems. However, I do disgree that these systems strip additives. My recommendation is to buy a dehydrator to use with the electrostatic and monitor TAN acid in oil tests. You do not need to change the oil until the oil analysis indicating negative oil condition. My company can provide the dehydrator or another technology that can handle the water and acid in the same system. The electrostatic cleaning system is safe to use for any length of time.It has no effect on the oil.The process cannot remove any dissolved components of the oil, so additives are not affected.The idea of using oil forever is not entirely wrong, because in a "clean","cool" and "dry" hydraulic system there is no possibility of oil dterioration. In such cases, 10% addition is sufficient.This is 10% every year, and not just once in a lifetime.This refreshes some additives which deplete by age. The idea is that oxidation is catalysed by metal wear particles in the presence of moisture, and heat.If you remove the causes, like particles by the Electrostatic system, and control your temperature, the oil stays as good as new. Also, the main property of oil, which is viscosity, never changes unless you mix two oils, or oil and water. Take 10% as the best case, worse cases may require 20%, but if controls are excercised, complete oil changes are never required. The parameter to check is Total Acid number, and it can be kept under control for years together. Since in Electrostatic Oil Cleaning Oil is charged with Electricity and most of the additives are of Metallic Oxides, how is that additives will not be removed from the Oil ? Who will control the quantity of replineshed additives and how to ensure that exact amount of additives are added in the oil ? If we have to add additives rendomly then there are many unscruplious suppliers are there in the market but why they are not flourishing ? Oil companies have spent a hell of the money in deciding the exaact quantity of additives in the oil.is it not worth it ? Electrostatic oil cleaning does not remove soluble additives. There is tremendous research backing this up. Please clearify my doubt about effect of electric charges on metallic oxides in the form of additives which imparts main properties to the Oil. How they will not be affected ? Can any one through some light on this ? There is a reply to the question of removal of metallic oxides here in this forum, by Greg.. The process is Electro STATIC not ElectroLYTIC. Hence dissolved components cannot be affected. In a static field salt will not separate out of water, for instance. Only particles, being separate from the oil, will be separated out. There is a wealth of trial evidence to prove that dissolved additives cannot be removed. Only "foreign" particles are removed. I have only talked about addition of new oil, from same manufacturer, same specs. Hence the only problem with frequent addition would be overflow of oil, not overdosage of additives. Your doubt would be valid if I had talked about addition of additive package separately. But that is not the case. Bala, additives deplete over time for many reasons and adding top up oil will help maintain adequate additives in you oil. Since the new oil containes the same amximum ratio of additives this ratio can never be more than it was to start with some will be depleted and the new oil will have the original makeup so the net will always be less than the whole unless you are somehow losing just basestock. Thanks Mukesh for clarification for Electrostatic and Electrolytic status of salts. Could you please clarify how electostatic cleaning will not be considered as Electrolytic ? When NaCl is dissolved in water and currant is passed through the solution, NaCl is sepeared out by chemical reaction then why not other salts ( Additives which are similar metallic salts !! ) in similar way ? Can you clarify the differance between Electrostatic and Electro Lytic solutions ? What is the differance ? On One hand you say that soluble Additives in the form of salts are there in the oil and oil is chatged with electricity then when you pass electric currant through it why these salts will not be affected ? I have learned from many users of electrostatic cleaners, that Oil is loosing it viscosity and it becomes thin, could it be because of depleation of any viscosity Index improver ? Now even after some lively discussion,perhaps you have still not got the satisfactory reply,opinions of experts differ in a large way. Electrostatic cleaners are good as they remove particles even smaller than 1 micron, but even if the moisture in the oil is more than 600 ppm or 0.06 % the cleaning machine will stop. Its Beta ratio is not mentioned as it is very slow. With regular 10% topping up you cannot continue the same oil for ever with this machine.Moisture present upto 600 ppm in oil itself is harmful and accelerates oxidation deteriorating the quality of oil gradually. Yes, posting by Samnugger is worth more attention here. Klarol Oil Cleaning System is capable of making the slogan "No More Change of oil" a reality by removing solid particles upto 1 micron and moisture 100%. You are mixing apples and oranges, all in an effort to undermine usefulness of electrostatic filters, which I see you don’t represent, and which technology is direct competitor to the technology that you are peddling. Your argument by comparing an inorganic salt of a strong acid and a strong base that fully dissociate in water (Na+ and Cl- ions) to stable non-dissociable organic molecules, is completely missing the mark. The fact is that transformer oil has antioxidant additives added to base oil, and is successfully for more than 100 years used as INSULATING fluid in transformers. This is possible because additives dissolved in oil are not dissociating on ions (like the inorganic compound that you offered as an example). Instead, they become a part of hydrocarbon aliphatic or aromatic molecules, and therefore do not conduct electricity. Also, I have never heard that electrostatic filters affect viscosity in any form or shape. Can you please provide some more info regarding the observed oil thinning that you mentioned in your previous comment? By the way, I am end user, and don’t represent any company and/or any product, but keep my mind open to learning and evaluating new products and new technologies. Thank you very much for clearing my doubts. But my customers who run the Electrostatic Cleaners for Months together have complained that Oil is becoming thin and gets oxidised faster and therefore I had mentioned it in my previous message. Thanks again for your guidance and clarifying my doubt. Electrostatic Oil cleaning is most popular in Plastics industry. Cincinnati Milacron also make Electrostatic Liquid Cleaners- and they are a big name in Injection Moulding. Electrostatic Oil cleaning is the best if not fastest method of cleaning oil to remove particles and sludge or varnish which filters can not remove. It is impartial to all particles and does not selectively charge particles, as someone has queried elsewhere in this forum. If you have solid particles as additives, like in Moly Sulfide dispersions, they may also be removed, If filters down to that size 4-5 microns are used they will also remove them. The difference in filters and electrosatatic cleaners is their capacity, and ability to address smaller particles. Filters are cost effective up to 10 microns or so, and electrostatic cleaners are a one size fits all type device, where cost is not a function of particle size. Particles below 10 microns ar where electrostatic cleaners are more cost effective. Electrostatic cleaning is STATIC, meaning that the main characteristic is ZERO current, and a high voltage. Electrolytic is characterised by high current and low voltages (comparativley) There is a high energy input to break down the ionic components, and this is reflected by a high current, the product Volts x Amps is very high, reflected by large scale transport of ions to their preferred electrodes.The current is by a dissociation of ions, and this consumes high energy. The electrostatic cleaners have transformers which cannot provide this high energy, they are only potential transformers.. if a current builds up, the voltage will drop drastically and the transformer will trip on a safety device. So, to carry on with your salt example, the electrostatic field will carry a particle of salt to the collectors, it just cannot provide the energy to break it up into sodium and chlorine ions and carry these ions to the electrodes. The product Volts x Amps is zero as current is zero. Just look at the other common use of this technology - electrostatic precipitators for flue gases from chimneys, they simply drop out the soot particles, the flue gas outlet is not chemically affected....otherwise the high temperature and high energy conditions are ripe incubators for dissociating oxides in the flue gase.But here again energy input from the electrostatic device is just not sufficient to cause any dissciation of oxides in flue gases.. I hope this makes the difference in Electrostatic and Electrolytic clear.. The static process just provides a field condition to separate out particles which tend to stick to "collector" media provided between the electrodes.like a balloon rubbed on a silk cloth will stick to a wall, or a pieces of paper will stick to a comb when you rub it on dry hair. Viscosity of oil is changed only if two oils are mixed, or temporarily by temperature. The thinnig that you may have heard about is probably removal of sludge or polymerised matter which makes the oil appear clearer and lighter. Measured viscosity will not change by electrostatic cleaning. Thanks for your clarifications. Can you please suggest to get the Oil cleaned up to NAs - 8 Level how many hours you have to run Electrostatic Cleaner? In short what is the clewaning capacity in Ltrs/ hr ? ( say to clean the oil from NAS - 12 to NAS - 8 Level ) and what will be the power consuption ? With cleaning rates of 2.8 gallons per hour and 5.6 gallons per hour, Electrostatic Filtration Systems are designed to be a permanent installed unit attached to a circulation system in a kidney loop configuration. The technology is based on varnish removal process being used to remove oxidation by-products in a slow almost reverse process of the way they were created. In a permanent installed system speed doesn’t really matter, thus the incredible results speak for themselves. I find confusing viws on properties of oil and working of electrostatic oil cleaner. Basicallt electrostatic oil cleaner major application is for filtration of hydraulic oil which hardly contains 5 % additives. Secondly the high voltage applied is 10-12 KV which is much less than break down voltage of oil. Electrostatic oil cleanerremoves only the suspended particles in oil and does not in any way affect physical or chemical properties of oil. The electrostatic oil cleaning is slower process than mechanical filtration. However, the cost of fine filtration even upto 5 microns using mechanical filtration is expensive operation as the dirt holding capacity of fine filtration elements is very limited and its price much higher as compared to collector media of electrostatic oil cleaner. We have achieved results uptp NAS class 5 cleanliness by using EOC. Hence EOC is an effective off-line cleaning equipment for hydraulic systems/machines. Electrostatic Oil cleaning system cannot have any beta ratio as i does not have any filter element or media through which oil is passed for filtration. In comparison to mechanical filtration where the dirt holding capacity of filter elements is limited, the collector media of electostatic oil cleaner collects almost 10 times the dirt and hence it is one of the most economical ways of off line filtration. Can you please give me some idea of availability of Dr. Sasaki's papers and research on electrostatic oil cleaning for additional information, as you suggested. Can Electrostatic Oil cleaning System be used in electroplating line ? The filtrate (oil or gas) must have a high dielectric strength and the contaminant must have a low resistivity. It seems to reason that plating baths are too conductive to be cleaned using dielectric fields. what you need to do is to take professional help on filteration rather than investing in it. As you need to also see the pay back. Also i have personally seen and heard of M/s Hymat - Gentelman Mr Dave ( 91+9324414802 ) who is involved in this work . This may sound as marketing message - but intention is to help the person who posted the message , as by now he is far away for sure from importing the unit. There are compnaies in India (Pune) dealing in similar equipments (ELECTROSTATIC) - so if you are in india you can call them. But for sure you need to have acess to a good lab. BCA systems have been in use lubricating oils for 11 years now. The second units made went to an old GE steam turbine to help solve problems with varnish and general lube oil related failures. Since the oil was installed, it has been topped off, but never changed. The plant manager still claims his lube oil it is cleaner than new oil. We also got results on a set of seven gas turbines where we installed systems 3 years ago. The lube oil was 2 years old at the time and varnish caused turbine trips were their reason to install our system. We recently got samples from the 7 turbines analyzed and found the oil to be in excellent health. Even the color was a perfect light yellow and they have not had a turbine trip since installing the BCA only systems. The original question was how long can oil last? At least 5 years with proper cleaning is the answer now. Call me for more information about these test results. Mr. V.S.Dave. The difference is that water is a highly polar material which will become an electrolyte any time a dissociative salt is dissolved in the solution. Oil is both non polar and unless the water content (normally <<1%) is extreme can not form an electrolyte. the result is the material used for additives will not be effected by electrostatic fields. "The electrostatic oil cleaning is slower process than mechanical filtration." Comments: Not true. The particle separation process depends on flow, and most electrostatic filters are LOW FLOW systems for a reason. That’s why they can collect small particles. If you’d run high flow through them then the efficiency would tremendously drop, because the electrostatic forces that holds them in the filter would be overcome by the kinetic energy of oil and particles would be washed away back into oil sump. On the other hand, if you’d run approx 3-micron mechanical depth-type filter at the same flow as an electrostatic (e.f. 1gpm), the results would be pretty competitive. "However, the cost of fine filtration even upto 5 microns using mechanical filtration is expensive operation as the dirt holding capacity of fine filtration elements is very limited and its price much higher as compared to collector media of electrostatic oil cleaner. We have achieved results uptp NAS class 5 cleanliness by using EOC. Hence EOC is an effective off-line cleaning equipment for hydraulic systems/machines." Comments: That may be the case in India. In the US, most of depth-type mechanical filters have comparable dirt holding capacities as some of the best electrostatic filters. Also, the price of a collector media of electrostatic oil filters varies, but in general, it ranges from being slightly higher than of the mechanical-type filters, to being competitive. In general, the choice of using one technology or the other and sizing them properly depends primarily on the particularity of the application this filter system will be use for. Factors to consider, among other things, include the rate of particles ingression (environment), degree of moisture present in oil (environment and/or the system), the rate of wear generation (the system), oil viscosity, and type/size of contaminants being targeted (desired cleanliness level). I have personally noticed high degree of disappointment some folks have towards filters for reason that has nothing to do with the performance of filters, and should be blaming themselves instead. Because they never knew, or considered and insisted on factors (mentioned above) when choosing filters, and ended up with an inadequate filter. When this is combined with a greedy salesman (selling them what is cheaper and what customer is willing to pay, and disregarding the fact that the sold unit is grossly undersized for the application), the final outcome is obviously disappointment. A bit of knowledge goes a long way. Making blanket statements could be misleading, because what works in your application (well, nobody knows what that is as you didn’t bother to mention it), may not work for someone in mining or paper industry. Also, it does not help to lump all the equipment of all manufacturers out there of either technology in the same bag and pass a judgment favoring one system over another. There always were and will be the "Good, Bad, Ugly" in this field, just like in every other field. Some are perfectionists always striving to break new grounds in the field, and there are others that are driven to make a quick buck. Therefore, the conclusions and judgments of the performances should be more specific. Elctrostatic filter would probably work but very slowly. Because of low flow rate oil would cool to 25 deg C and viscosity would drag most contamination through.